We went to Pesca Lakes to see the Dalmatian pelicans. And we found so much more. Someone once said, “There is no there, there.” They may have been talking about Prespa. You have to be careful driving here. A wrong turn and you are in Albania; turn the other way and you enter Macedonia, called Sopkja by the Greeks. Most everyone was involved in harvesting the local beans when we arrived at Hotel To-Petrino in the tiny village Agio Germanos and we had trouble finding the owner, whose name may have been Toseos. 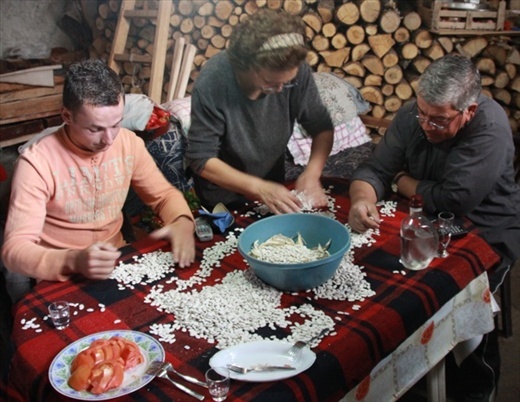 Her brother (or brother-in-law,) Bill, handled the translations and after we found our room, they invited us into the barn where Toseos’ husband, who never once said a word, and an Albanian hired-hand were sorting just harvest beans. “Of course, we would like to have a drink with them,” I replied politely, and they started pouring. I didn’t catch the name for it, but it is distilled from grapes, tastes a bit like tequila and is rumored to be 65% alcohol. Maybe more, judging by the look on Connie’s face after a sip. We wandered to one of the two restaurants in town and asked if they had a menu in English. Even better, the owner took us into the kitchen to show us what he had. Cheese pie, cheese and leek pie, bean soup and he could whip up a local pasta soup in a few minutes. Several pork loins turning on the spit wouldn’t be ready for an hour or more so we opted for the pies and soup. The bean soup was spectacular. Connie’s pasta soup tasted like sour cream of wheat; the “pasta” was more like couscous. I told the owner Connie was a fussy eater when he noticed she didn’t finish. He said to me, “But you like it?” and laughed when I said “Not really.” It’s a local dish I guess. Agio Germanos is only 3000 feet above sea level but on this first night of October the fire in our room felt pretty good. And we added the pygmy cormorant to the Dalmatian pelicans on our bird list.